Most of us know the Oscar-nominated actress Diane Ladd as the mother of Oscar-nominated actress Laura Dern (for the same film! ), as well as for her phenomenal work in movies, but she is also a healer, an ordained minister, writer, nutritional lecturer, and more. Her book is an honest account of her Southern (Mississippi) upbringing, her career as an actress, her role as wife and mother, and dealing with "things" in life, love, and the physical and the mental "components" of life. It's about her own discoveries during her lifetime and how we can learn from them. How we can live better lives. Heaven knows, we need all the help we can get. Our world is in such bad shape. Ms. Ladd's book is easy to read and easy to comprehend without the unfathomable medical words and diagnoses. Hers is a straightforward and sensible approach to living a good and healthy life. I loved the chapter on Judgment and Forgiveness and the Woo-Woo Story. Eerily remarkable. 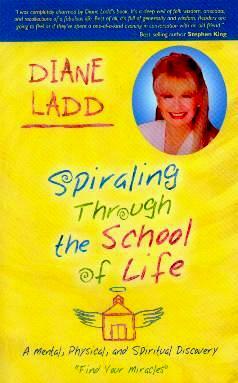 Ms. Ladd shares with us her wisdom on love, spirituality, family, health, and other aspects in our dysfunctional world. This is a fantastic book in that it's full of life lessons, good and bad, and full of common sense too. It's uplifting, moving, and inspirational. I wish everyone would read this book and put into practice its messages - we'd be well on our way to cleaning up our abused planet. Visit Ms. Ladd's website at www.dianeladd.com. Conclusion - Sound and constructive advice in the midst of a memoir. We'd do well to follow this advice.